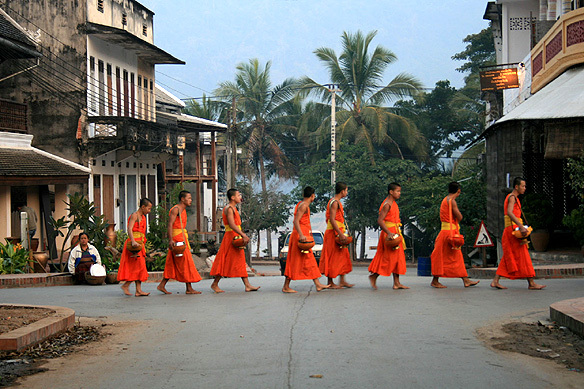 Luang Prabang resonates with sacred chants and harmony. The various layers of life in this charming, medieval, religious town blend seamlessly into each other to create a complete whole. From the saffron robed monks going about their daily tasks to the local Lao whose lives revolve around the wats; from the night market which sells indigenous handicrafts to the thronging tourists, to the tourists themselves, mature and sensitive to the spirit of Luang Prabang. Nothing jars here. Nothing irks. Every aspect of this palm fringed, sleepy, former royal capital by the Mekong is in peace with itself. 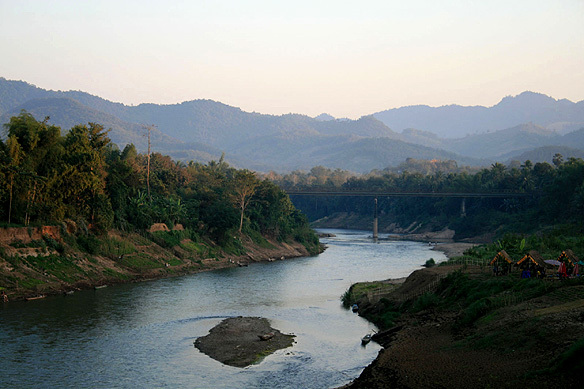 There are probably just 10,000 inhabitants in the city proper of Luang Prabang. Situated at the junction of the Mekong and Nam Khan rivers, the city is home to a wonderful array of gilded temples and French colonial buildings. It was founded on Mount Phousi, a small rocky hill with leafy slopes and has been a mountain kingdom for over 1,000 years. In the 18th Century there were around 65 wats. Many have been destroyed over the years but more than 30 still remain intact. 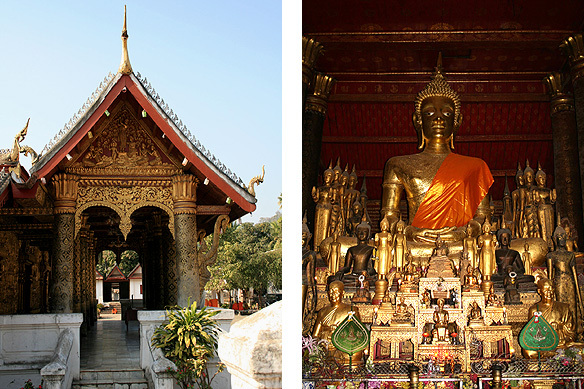 The most beautiful of them all are the royal Wat Xieng Thong, Wat Mai, Wat Visoun and Wat Aham. 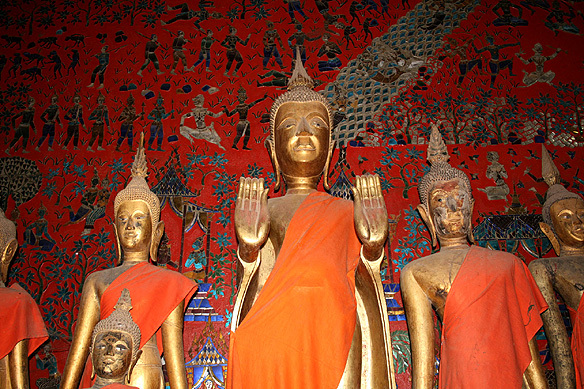 Glittering with carved gold foiled doorways, painted walls, vivid jewel-like mosaics, and the eternal ever-present family of Buddhas in the inner halls, the wats are like gilded birds. The splendour and historical significance of the town led UNESCO to designate Luang Prabang a World Heritage Site at the end of 1995, and declare it the best preserved traditional city in South East Asia. The name of the city refers to the Holy Pra Bang, Laos’ most sacred effigy of the Buddha which was given to Fa Ngum, the warrior king and founder of the city, by his father-in-law the king of Cambodia. Fa Ngum is credited with the founding of the Lane Xang Hom Khao, the Kingdom of a Million Elephants White Parasol, in 1353 and establishing the Lao royal lineage which was to last 600 years. Built in 1924 by the French for the Lao king, the Royal Palace is also known as the National Museum. 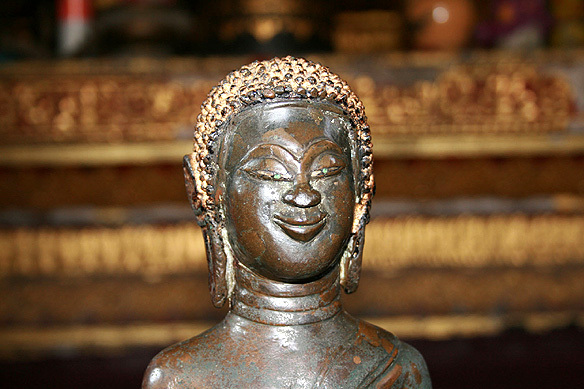 It now contains a collection of 15th-17th Century Buddha statues and artifacts from the many wats in Luang Prabang. The most important piece is the Pra Bang reputed to have come originally from Ceylon, and said to date between the 1st and 9th Centuries. The Buddha is in the Abhayamudra or dispelling fears pose, and is 90 percent solid gold, stands 83 cm tall, and weighs 53kg. Next to the Royal Palace is the Wat Mai. 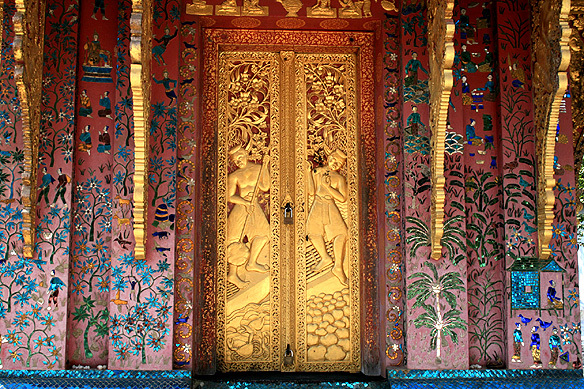 The temple forms part of a medieval sacred ritual in which during the Lao New Year, the Pra Bang is taken from the Royal Palace and installed at the Wat Mai for its annual ritual cleaning, before being returned to the palace on the 3rd day. Wat Xieng Thong is the finest example of a Lao monastery with graceful, low sweeping eaves, beautiful stone mosaics and intricate carvings. 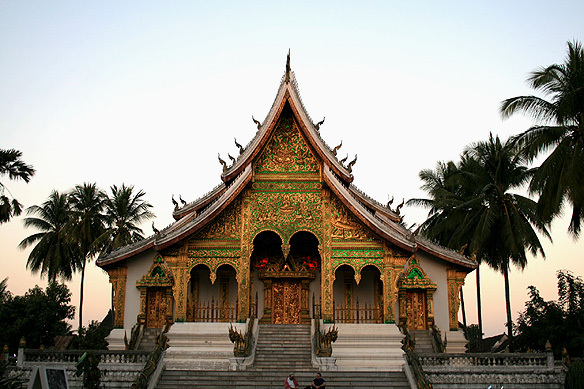 It dates back to 1559 and was an important element in Luang Prabang’s designation as a World Heritage Site. You can’t rush through Luang Prabang. It is a town which envelops you in its own pace, drawing you in to feel and enjoy its treasures languidly and tenderly. My days were spent giving alms to the monks at day break, wandering through the 30 odd wats, praying to the eclectic collection of Buddhas, joining in the chanting at dusk. 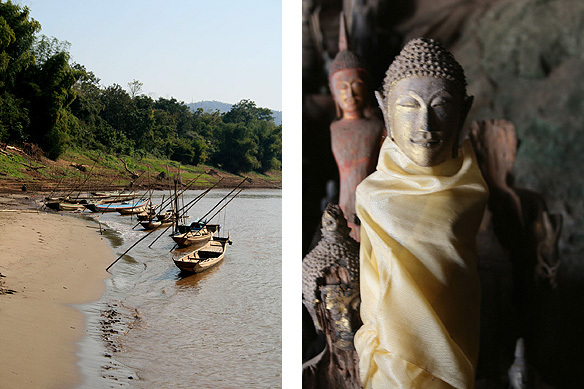 A cup of coffee at Jomo’s, a stop at one of the many bookshops, a stroll through a palm fringed by-lane to reach the waters of the Mekong hugging the embankment … you simply can’t rush through Luang Prabang. Because here every moment demands to be lived and felt, in god’s tranquil grace. 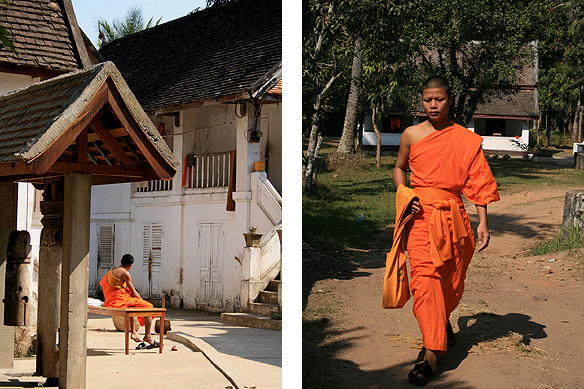 Luang Prabang reaffirms the absolute simplicity of life. It reaffirms the harmony prevalent in faith. This entry was posted in Exploring our World, Laos and tagged Buddhism, Buddhist Monastery, Kingdom of a Million Elephants White Parasol, Lao New Year, Laos, Luang Prabang, Mekong River, National Museum, Pak Ou Caves, Pra Bang, Responsible Travel, Things to do in Laos, UNESCO World Heritage Site, Wat, Wat Mai, Wat Xieng Thong by Rama Arya. Bookmark the permalink.